If you follow social media trends at all, you’ve surely heard that Instagram has stepped into the ring to take on Snapchat. If not, here’s what happened. Snapchat offers a feature called Stories, which allows users to post a series of photos or videos that disappear after 24 hours. Instagram has replicated this feature, allowing Instagram users to share pics and videos that won’t show up in their profiles and instead disappear later. Instagram has copied Snapchat Stories, right down to the name. Instagram's Stories feature is similar to Snapchat Stories in that the Stories are available for a mere 24 hours before they disappear into the wild. The Instagram Stories feature is Facebook’s way of trying to compete with Snapchat's growing popularity with teens. This has been especially problematic for Facebook and Instagram as Instagram's engagement has been on the decline. Facebook offered to buy Snapchat for $3 billion in 2013—Snapchat, however, rejected the offer. Facebook owns Instagram, so in order to compete, both Facebook and Instagram are now offering similar services to Snapchat. Snapchat is one of the most popular social media apps on both the Android and iTunes app stores, so Facebook and Instagram had to go big in order to compete. What better way than to imitate Snapchat's ephemeral photo feature? You know what they say, if you can't beat 'em, join 'em. How can businesses use Instagram Stories to their advantage? Read on to learn what this means for social media as well as how your business can get in on the Stories trend. Let's start by breaking down how to create an Instagram Story. 1. Click the plus sign at the top left of the screen. 3. You can also swipe down to see all the pics you’ve taken in the last 24 hours and add those to your Story. 4. Click the pencil to draw on the image or the Aa button to add text. You can also click the down arrow at the bottom right of the screen to download the picture. If you’re not satisfied with any of your changes, you can click your smartphone’s back button or cancel to start over. 5. Swipe left or right to add filters. 6. Tap the up arrow to upload the photo to your story. 7. If you uploaded a photo or video by accident like I did while testing out the steps in this list, tap on your story at the top of your Instagram home screen, tap until you get to the video or photo you want to delete and click the three dots at the bottom right to delete that image or video. 8. To feature a particular part of your story, tap the story and the part you want to feature. Click the up arrow to share that image or video to your profile. How can small businesses take advantage of Instagram Stories? The roll-out of Instagram Stories is great news for businesses. Since Instagram's algorithm recently changed to show what Instagram considers the “best” posts (most likely to engage followers) first, this meant businesses had less of a chance of always showing up in followers’ feeds. Now, though, when a business creates a Story, it will appear at the top of followers’ Instagram home screens. And when followers are watching Stories, Instagram automatically shows them the next story. That means your Stories are likely to be seen by your followers if they are watching other stories, as your Story will automatically play when the follower finishes the preceding Story. For our first Instagram Story, we took some behind the scenes photos to show what it’s like to work at RevLocal. (Why yes, we did have a Friday queso cookoff.) Behind the scenes photos help consumers as well as potential employees get to know who your current employees are and give followers a chance to see what your day-to-day looks like. Not only could it make you appear more trustworthy when your followers get a private glance into your business, but it can help them to learn enough to decide whether or not they want to work with (or for) you. And letting followers get to know your employees isn’t the only way to use Instagram Stories for business. Here are a few other ways you can take advantage of the marketing power of Instagram Stories. Show off products and services. Show off what makes your business special. If you own an ice cream shop, add photos of delicious looking mint chocolate chip waffle cones to your Story. Run a clothing store? Create an attractive display, take a pic and add it to your Story. If you have a new product that is about to launch, you could add images of the product to your story. Offer a time-sensitive discount specific to Instagram Stories. Not only will it create a sense of urgency since the image is gone in 24 hours, but it will make your Instagram followers feel special knowing they got in on a secret discount. Since both apps allow for local targeting, advertising your local business on Snapchat or Instagram could be profitable. Unsurprisingly, the majority of Instagram and Snapchat users are 29 or younger. (Snapchat says that 50 percent of its users are below the age of 25.) However, it's a safe bet that both applications will continue to look for ways to attract older users. Although Instagram Stories was just released, it is expected that Instagram will quickly develop a way to generate revenue from it, which means it will probably take another page from Snapchat's book. Snapchat's advertising is relativity new, but with 150 million daily users, businesses are taking notice. While Snapchat advertising has made a splash with big brands, the company recently lowered its advertising costs, which could signal a move towards more affordable advertising options. One Snapchat advertising option that local businesses are already taking advantage of is Geofilters. Geofilters are photo overlays users can add to their Snapchat photos. 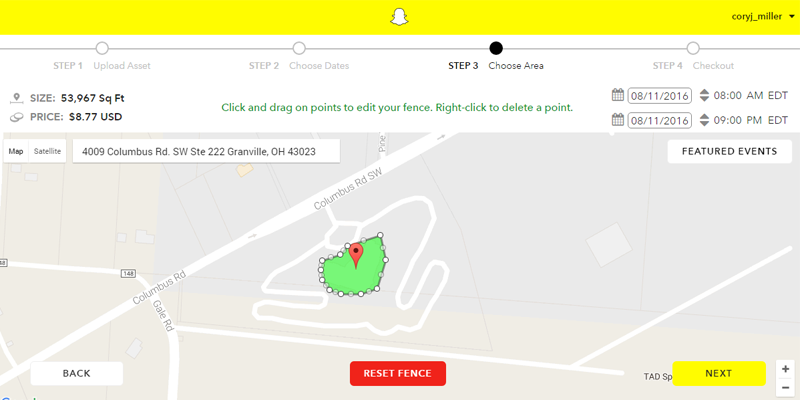 Geofilters are location-specific, so it's only visible to Snapchatters taking a photo or video inside a specific geofence. However, with Geofilters costs starting below $10.00, the feature could be an inexpensive way to market your business. (Analytics are even available to see how many views and uses your Geofilters receive). Because of the popularity of Snapchat Geofilters (over 800 million are viewed per day), it's likely that Instagram will soon offer a similar feature to users and advertisers (it copied everything else). Keep an eye out for that. The question everyone is asking is, “Will Instagram Stories kill Snapchat?” And the reason for Instagram Stories is (at the very least) for Facebook and Instagram to compete with Snapchat by offering similar features. Still, the long-term effects remain to be seen. While the idea of the new Stories feature is probably to keep users on Instagram longer (why go to Snapchat to create a story when you can do it all on Instagram now?) it doesn’t seem to be hurting Snapchat too much. Some say Snapchat will need to improve its platform or suffer the consequences, but many people are only using Instagram Stories to ask followers to follow them on Snapchat as well. Facebook and Instagram will surely continue to compete with Snapchat in order to gain back some of Instagram's declining user engagement. Facebook is currently testing a filter feature, dubbed “creative effects,” which allows users to swipe left and right and add filters to images they upload to the app. But, will Instagram Stories kill Snapchat? Probably not. Snapchat is hugely popular, and it would take more than one new Instagram feature to bring down the ephemeral messaging app. Think of Instagram Stories as another avenue to market your business online and drive consumer engagement. While Snapchat will have to stay on its toes and continue updating its features now that it has some real competition, that doesn’t mean Snapchat is dead (or even knocked out). It will simply have to work harder to keep users on the platform now that Instagram can do what it does and more.